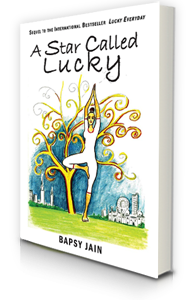 A Star Called Lucky picks up in present day New York City where Lucky Boyce has reinvented herself as an unconventional yoga instructor following the lessons learned in Lucky Everyday. She is on a mission to change the lives of cynical inmates through yoga by presenting a comprehensive rehabilitative program to the New York State Department of Corrections when her life takes a sudden turn. In an expected twist of fate, Lucky is catapulted from her peaceful, balanced routine into a chaotic, transcontinental pursuit to bring down a corrupt businessman and politician. He tries to strong arm Lucky into using her talents and connection to India to bring him a mysterious, and possibly illegal, remedy to a rare strain of flu. Once Lucky realizes his desires are selfish, a bit evil, and based on monetary goals alone, she embarks on a cross-continental mission to warn an illusive doctor responsible for the remedy of the danger awaiting him, risking her life along the way. Jain adds a young, awkward computer savant and intriguing Buddhist monk to Lucky’s bag of tricks as she tries to combat the power of corrupt politics. The novel is riddled with questions about the inherent goodness of human nature as Lucky’s life is catapulted from her peaceful mission of bringing yoga to inmates into a chaotic, transcontinental pursuit to save a doctor on the other side of the world, and possibly a nation. To maintain balance, Lucky continually turns to yoga and the voice of her spiritual guru, Shanti, to keep her spirits up, recalling teachings like, “When the world goes upside down, you need to stand on your head.